Travel, Conservation, Animal Welfare and stories of an all around great island life. One of the things I enjoy most about traveling and just getting out and about in general is the comic relief it provides. Some of the stories end up being more of an inside joke, you know, the kind you can’t really appreciate unless you were there, but some thankfully are just universally funny. 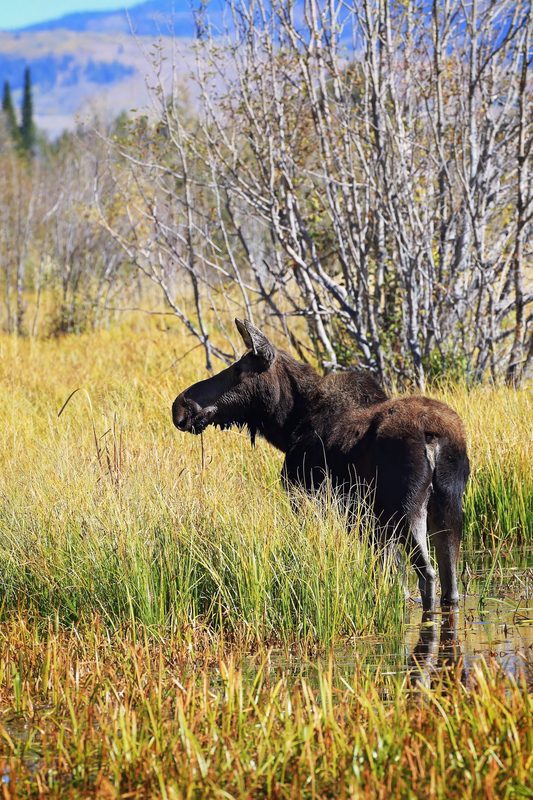 This story falls into the universally funny category and revolves around one super cute little moose and its moose mom which spent several days in the marsh which runs along Moose-Wilson Road. I’d heard reports of some fantastic sightings of this little cutie early in the morning and sometimes mid-afternoon, but I kept missing it, being elsewhere in the park hiking or exploring. Finally as luck would have it, I got a call from some friends who had been with them for about an hour late in the morning and I was nearby after just finishing a hike with a friend. We hightailed it over there in 2 separate cars and although parking is always really challenging in that section, we were optimistic we could find a spot to sneak in. I was especially lucky finding a little dirt patch just off the road 50 yards from the moose and her kid that was a perfect fit for my dime sized rental car. I darted in, and hopped out with my camera super excited to catch up with my friends all of 60 yards away…..
Unit the ranger jumped in to assert his authority. Under no circumstances was I allowed to walk 60 yards down the road to take photos. Absolutely not. No way. How could I even consider such a thing? I must get back in my car – and drive those 60 yards! Park somewhere else close to a half mile away, then hoof it down that road instead. Not this road. Not his road. I was completely shocked! Really? I felt really confident and still do that the mommy moose and her kid could have cared less about those 60 yards of road whether I was walking them or hopping them or doing summersaults. But apparently the ranger was super serious about controlling his asphalt so I let him believe he had won and turned towards my car. Only to flag down a car about to pass, beg the guy to give me a ride – for 60 yards – to my friends. He had his mom hop over in the back and I jumped in, smiling as we drove by the ranger and I hopped out. It makes me laugh to even type about it. That ranger was so mad his plans to dominate the roadway had been foiled by some little blond girl in flip flops. Needless to say us photographers are a crafty and patient bunch so I just stayed long enough that even the ranger got bored and as the moose took a nap in the swamp with her kid, I took a leisurely 60 yard walk back to the car and chalked it up as a win for the day. I am Professional Photographer based out of Maui, HI. The passion behind my photography business is (1) to travel and volunteer both within the US and abroad with various animal sanctuaries to (2) capture valuable visual and written documentation to be able to (3) put to use in educating others. This all done with the hopes of being able to give back as much as possible both within the local community as well as internationally - especially when it comes to environmental protection and animal rights. People can't begin to fix a problem if they don't know it exists. This entry was posted in Environmental Solutions, Life, Photography Fun, Travel and tagged Grand Tetons National Park, moose, moose calf, Photography, tourism, travel, travel adventures, wildlife, wildlife photography. Bookmark the permalink.